Starving to get into heaven? This might make it sound like I didn’t like the book. The funny thing is I liked it a lot — the writing is gorgeous, the characters are deftly drawn, the mood of the room in which Anna resides is evocative to the point of feeling claustrophobic (well, the author’s had some experience writing about that kind of space before, hasn’t she?) and her depiction of the outsider coming up against a culture she doesn’t understand is spot on. I also very much liked the interaction between the nurse and her patient, and the way this changed over time as the pair developed a genuine fondness for each other. It’s got a great cover, though. Oh yes, the cover is gorgeous. And the hardcover book, which is slightly smaller than usual, is lovely to hold in the hand. It sounds like it wasn’t up to your expectations, though. To be honest, I didn’t have any expectations… I liked the book a lot, it just didn’t bowl me over. I’m sure many people will absolutely love it though… it’s got bestseller written all over it! I have found Donoghue to be consistently overrated myself, just a little bit, although I have liked some of her books more than others. I think that some books get so much hype and attention that virtually nothing could live up to it. I just finished reading this one last night, which makes it all the more interesting to read your thoughts right now. I thought about avoiding it, so as not to influence my own thoughts, but I couldn’t resist. Overall, I think we feel very similar about the book. I won’t go into details right now, though – I’ll save it for my review. I haven’t gotten very far yet, but I think I’ll like the nurse a lot. I’m curious to find out whether I can figure out the solution as quickly as you have. Oh, that’s interesting… I’d forgotten about Ellen Greve. I read a longform piece of journalism about her years ago; it was fascinating how she was so convinced that what she was doing was authentic when it was clearly not. But I know what you mean. Her name will draw in the crowds (I get the impression she’s hugely popular in Canada) and perhaps if they like this book (which they will; it’s a perfectly nice book) they may be tempted to explore others on the prize list. Which is no bad thing. 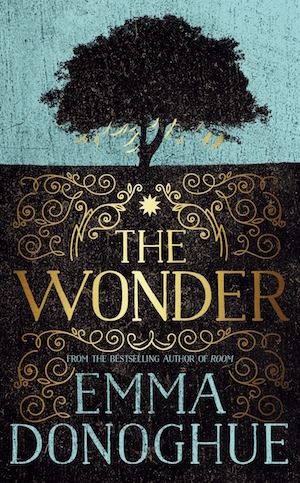 I’ll probably read this book at some point but your review was interesting given that I heard Hannah Kent speak this week about famine, folklore and religion – and how the three were entwined, and how the Great Famine shifted the balance between religion and folklore. Interested to see if this will influence my reading of The Wonder. It sounds like the two books would be good complementary reads, especially if read back to back. I’ve been wondering (another pun!) if I would attempt this or not. I was thoroughly bowled over by The Room which caused me to read her earlier book, Slammerkin. It was a great holiday read. But Astray & Frog Music didn’t grab me at all – I did not finish either. I might stick to Hannah Kent’s Irish story instead. My high hopes for Madeleine Thien’s book winning the Giller & Booker are increasing. It’s nowhere near as good as Room. I remember reading a very early proof of that in one day. It left me feeling dazed for about a week afterwards. Such a powerful book! I’ve not read any of her other novels, so not sure how this fits into her oeuvre in terms of whether she’s building on common themes she writes about etc. Madeleine Thien’s book will be next on my list!